First Attempt at KAP with the Goliath Barn Door Kite! Up until two days ago, I was convinced that Kite Aerial Photography (KAP) is for the "serious" kite flyers. I was automatically ruled out of this category. I thought "Who in their right mind would send more than $100 worth of equipment aloft in a kite!" I was even more shocked at the radio equipment that goes into the fancy ones. My first attempt was less than a success early last year when my PLT box kite got crashed into the beach after only 3 minutes of dizzying video. At least I learned from it! I chose to start anew this year by building a KAP rig with a Picavet suspension for my flip camera. I was confident in it's ability to carry the camera after two moderately successful flights over the last month. 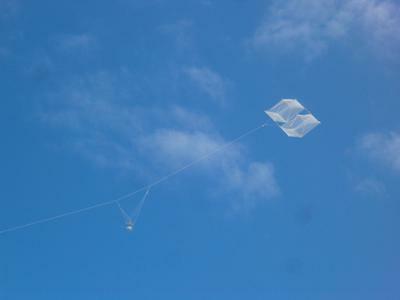 There was still some anxiety because the kite develops a lean in higher winds. I am convinced that I made an error while building this kite since I can't effectively fix it. Attaching tails is the only way to achieve relatively straight flight in low/moderate winds. However, the leaning is still very pronounced at higher winds. The Internet was invaluable when it came time to design and build a rig. KAP rigs range from simple, non-adjustable cradles to radio controlled cradles. These use servos to move the camera up/down, left to right or 360 degrees, and most have a shutter servo. There is also a great deal of creativity involved in both the appearance and the mechanics. Aluminum was an obvious choice since I had access to scrap aluminum angle along with rivets and other metal fabrication tools such as a band saw, drill press, and files. Another reason was the many years I have watching my father and his friends build aluminum airplanes. Aluminum is not my favorite medium to work in, but it works well enough. Based on the scrap aluminum laying around, I chose to use 1/2" angle for the cross and 3/4" angle for the cradle. This can be purchased at any hardware store for a very small price. It can often be found for free if one knows where to look. The construction took less than an hour using a band saw for the cuts and a drill press. Since this is a proof of concept, I spent very little time making it look pretty which saved a considerable amount of time. I used 1/8" brass rivets that require a rivet squeezer, but I would suggest using pop rivets instead because they are lighter and its easier to make them look good. I used a nylon 1/4-20 screw to attach the camera using the tripod mount. Many online sources tell you to use pulleys for the Picavet suspension, and I can see why, but it isn't 100% necessary. In fact, I used the smallest steel eyelets I could find. They would be threaded into the aluminum so I wanted to keep them small and light! The completed weight was only 255 grams! Once these were mounted, I went online and consulted Google Images for a diagram of the Picavet system. The lines may seem daunting, but they are really not as bad as they look, but still a good thing to have printed for reference. An hour later I had it threaded through a split ring at each end where the suspension joins with the flying line. Much to my delight it worked! After debating whether I should use a regular digital camera or a video camera I opted for the video camera. The way I see it, I can pull stills off the video when I watch it at home and save risking my RC equipment along with my good camera. Last Saturday, I went to the beach and lifted my KAP rig up to about 200 feet with good results. Since I have never flown one of these, I substituted a screwdriver for my camera. As it turns out, nothing bad happened and I could have used the camera instead. That was at the beach with my rhombus box kite and a howling 15+ MPH wind. The next time would most likely be inland with iffy breezes and my Multi-Dowel Barn Door kite. After Church on Sunday, I went out to Willamette Park for a flight with the hopes of getting the rig up for my first video session. I was confronted again by an epic knot in the BDK bridle. I chose to persevere and get this thing flying since the wind was OK and I had the time. Thirty minutes later I was ready to go again but the sail had at least five holes in it along with two repaired pockets. 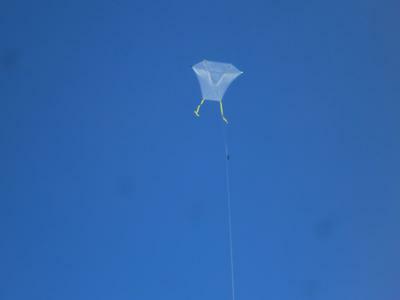 Once the kite was about 30 feet up, I managed to untangle the lines on the rig's Picavet suspension and let it go up. Long story short, a storage system is required for the suspension. To accomplish this, I hook the two attachment rings together, twist it as far as I can, wrap it on the cross and finally hook it on one of the eyelets. 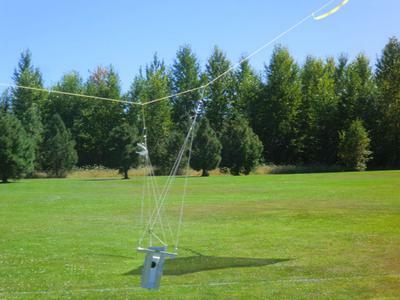 After several attempts, I was able to get it up to 300 feet for awhile and later up to a higher level with better wind. This first video lasted about 16 minutes followed by a video of 12 minutes. Both videos were a success by my standard! I was able to capture a video of the park and some of South Corvallis. The huge Barn Door was amusing to watch as it would move about with slack in the line on it's hunt for thermals. I never observed a situation where the kite got "backwinded," but it was very docile even with the rig hooked on. Maybe it will perform even better once I rebuild it with a nylon sail that will withstand the demands of moderate weather at the coast as well as light inland breezes. I do still see potential in the BDK, but I think I will try an 8 foot Rok while I rebuild the sail. Once again, I got several people watching the Goliath kite as it loomed about the sky. I am in the process of choosing a good KAP kite right now. I'm tied between a Delta and a Parafoil so any input is helpful. I'm mainly looking for a stable platform so I can add some radios etc. to the rig. I will report again when I get better video to share. Download the e-book Making Dowel Kites here. The Multi-Dowel Barn Door kite described above is in there! Comments for First Attempt at KAP with the Goliath Barn Door Kite! I also plan on making a GREAT, BIG Rok using the spars from the BDK! I think a Rok will be easier to set up at the field. I'm not sure if I will use your design, or make a 3:4:5 Rok. Just hours after posting my report with the KAP weight-test experience, yours comes in with a similar focus! The videos will be up on Youtube soon for anyone who wants to see them.